One of the main things that people complain about when it comes to modern living, especially those with families, is that there is simply not enough space for all of the things you need in your daily life. 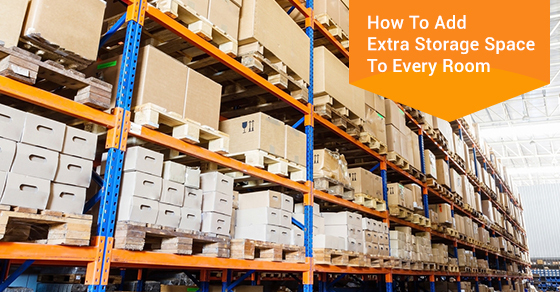 Many people start to feel bogged down by clutter and can start to feel like hoarders, when in reality, there are a lot of storage options at your disposal to help relieve some of the burden. Below are some creative ways to add storage space to every room. One of the largest unused storage spaces in the bedroom is the vertical space below the bed. Some beds are elevated enough that there is room to shove a couple things underneath, but to really make the best use of that space, you need to invest in a storage bed. These beds have ample built in storage space right underneath that give you a ton of extra room to store whatever you like. Storage chests don’t have to look out of place. Many of them are elegantly designed to add style and ambience to a room while also being functional. A storage chest can double as an ottoman or a coffee table. It can help you maximize living room space minimizing clutter. One of the rooms in your home that is bound to take the most damage is the mudroom. Constant coming and going, scuffs and dirt on the floor, shoes, jackets and umbrellas all over the place. A good way to keep the mudroom in order is with a mudroom bench. This can be tastefully placed adjacent the door and become the home for seasonal clothing like toques, scarves, hats, etc. that you don’t need out in the open all year round. For many people, the TV becomes the focal point of the living room and we dedicate quite a lot of space to it and its accessories. This is especially true if it’s a traditional cabinet-with-the-tv-on-top arrangement, where the TV takes up a ton of valuable vertical space. Try rearranging the setup and investing in a wall-mounted cabinet to house your TV, leaving you with a bunch of additional storage space underneath. It’s easy to take a look around your home and feel as though you have maxed out your storage space. This, however, is often not the case. With a bit of creative thinking, and an eye for unused vertical space, you can easily add some very useful square footage to your home and find room for those items that were previously cluttering things up.